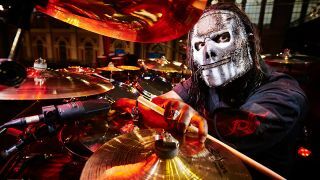 Slipknot’s Jay Weinberg has posted a grisly shot of his drum kit on Twitter, as the band continue to work on their new album. They’ve been putting the pieces in place for the follow-up to 2014’s .5 The Gray Chapter over recent months, with the record expected to arrive later this year. Frontman Corey Taylor checked in from the studio last week – and Weinberg has followed that with a shot of his snare drum, which is covered in blood.